KANSAS CITY, MO - Hiland Dairy is announcing a voluntary recall of half-gallon premium whole milk chocolate that is produced at the Kansas City, Missouri facility, over concerns the products may contain eggnog that could affect those individuals that have sensitivity to egg allergens. People who have an allergy or severe sensitivity to eggs run the risk of serious or life-threatening allergic reaction if they consume these products. No illnesses or allergic reactions have been reported at this time. Hiland Dairy initially learned of a potential issue and then confirmed after internal quality control testing at the Kansas City facility. 1,151 one-half gallon units of Hiland Whole Chocolate Milk were affected. The company promptly contacted the U.S. Food and Drug Administration (FDA) to initiate the voluntary product recall. 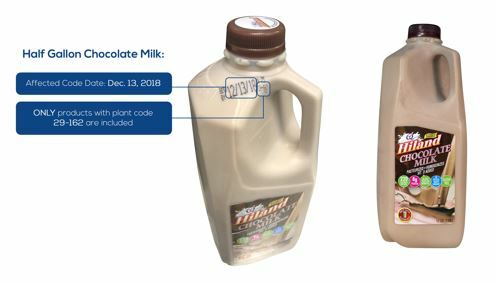 Other Hiland Dairy Chocolate Milk including, 2% reduced fat and skim, are not part of this recall. Hiland Dairy is working in partnership with the FDA to fully investigate the matter and comply with all necessary recall procedures. The Company is also taking the necessary steps to address this issue and apologizes for any inconvenience caused by this product issue.